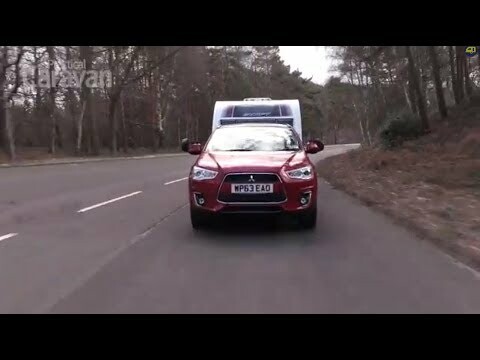 Practical Caravan's tow car guru David Motton has put the Mitsubishi﻿ ASX 4 2.2 4WD Automatic through its paces -- watch, like, share and comment on his video review! Mitsubishi’s ASX crossover has been revamped for 2014. The update includes revised rear suspension, improved standard kit and lower prices to compete against the likes of the Nissan Qashqai and Skoda Yeti. You can now choose a model with the brawny 2.2-litre diesel from the larger Outlander, matched to an automatic gearbox. This is the version that has joined our long-term fleet and which is on test here. It costs £23,899. Practical Caravan's reviewers look closely at the list of standard kit to see whether the more keenly priced ASX represents good value. Stability at speed and excellent performance from the powerful diesel engine are also among the qualities we’re seeking, as well as space for passengers and luggage. For a car of this size, the Mitsubishi ASX has a healthy kerbweight of 1595kg (once you allow 75kg for the driver). This gives an 85% match figure of 1356kg; the ratio is recommended for safe and stable towing by the leading caravanning clubs and Practical Caravan's experts. The towing limit of 1400kg is surprisingly low, though, which may bother experienced drivers ready to tow heavier vans. The 2.2-litre diesel should have no trouble pulling vans up to the legal maximum. After all, Practical Caravan's tow car experts have towed using the larger, heavier Mitsubishi Outlander fitted with the same engine and had no complaints about its performance. With 147bhp and 266lb ft of torque, there’s plenty of muscle for the task. Our reviewer matched the Mitsubishi ASX to an unladen Swift Expression 514 with a mass in running order (MiRO) of 1256kg and towed on the road and at the test track. As expected, the engine coped easily. When accelerating from 30-60mph, as when joining the motorway, the ASX posted a respectable time of 13 seconds. In regular towing, however, the gearbox held on to high gears for too long, allowing the engine to labour. The auto also hunted for the right ratio when pulling uphill. Paddles behind the wheel allow the driver to take charge, avoiding dithering over the right ratio and making the most of the engine’s considerable poke. Strong acceleration is matched to decisive braking. In normal towing, we found the Mitsubishi slowed smoothly and, with the pedal pushed to the floor, car and caravan stopped from 30mph in 10.8m on a dry track. At motorway speeds the ASX proved to be stable, rarely needing more than slight steering adjustments. At a steady 60mph, the Mitsubishi was secure and composed. Practical Caravan's emergency lane-change manoeuvre was tougher. The light steering is unresponsive either side of straight ahead, so it fails to inspire confidence, and the soft suspension allows a lot of lean when the car is pushed hard. Some rivals, such as the Skoda Yeti, change direction more decisively. Still, the caravan was never about to take charge. The hill-start test showed the Mitsubishi ASX in a better light. The handbrake held car and caravan still on a 1-in-10 slope, as long as it was pulled on firmly. The automatic gearbox made for an easy getaway, with no need to juggle clutch and throttle as you do in a manual. With plenty of muscle the ASX tackled the slope happily in first gear or reverse. On dry Tarmac, we left the ASX in two-wheel drive. Had the weather been damp, pressing a single button would have selected four-wheel-drive auto mode, which sends power to the rear wheels whenever needed. Another prod on the same button locks the car in four-wheel drive, useful if towing at a muddy campsite. All in all, the ASX is solid and dependable. Practical Caravan's expert reviewers have reservations about the automatic gearbox and the lane-change test was average. Otherwise it tows well. If you’re an experienced driver, though, you may find the legal towing limit too restrictive. If you're wondering what tow car to buy, this is worth considering. It’s not a car that grabs you in the first mile, but the more Practical Caravan's reviewers drove it, the more they liked it. If you worry about steering feel or agile cornering, the Mitsubishi ASX is not for you. There is a lot of lean in corners when you’re in a hurry, and the steering is unresponsive off straight ahead, although past the initial sluggish response it becomes more precise. The ASX is more at home at a steady pace. The revised suspension is comfortable, but it can be caught out by very rough surfaces. Around town, the tight turning circle is useful and in traffic the automatic box makes for smooth and unflustered progress. Its shortcomings are much less noticeable in regular driving than when towing. Some of Mitsubishi’s revisions for 2014 are intended to improve refinement. These have been partially successful. Road noise is a little less noticeable than before, although it’s still more prominent than in a Peugeot 3008, for example. Accelerate hard and the engine is too vocal. This is all the more reason to take it easy rather than to rush. If that’s your normal driving style, you’ll find the ASX easy to pilot, thanks to a smooth gearbox, light controls and decent visibility. Just don’t expect the Mitsubishi to be entertaining. The cabin in the ASX is another area that Mitsubishi has improved for 2014, with a higher standard of finish. Everything seems well built and made to last, but some rivals have a more upmarket feel. In terms of passenger and luggage space, though, it’s largely as you were. The panoramic sunroof fitted to the top-spec ASX 4 steals a little headroom, but you’ll need to be very tall indeed to mind. Practical Caravan's reviewers found the extra glass area brightened the dark cabin. There’s enough head and legroom for drivers of most shapes and sizes to get comfortable behind the wheel. The seat is quite high, though, even on its lowest setting. That’s fine if you want a 4x4-style lofty view, but it won’t suit everyone. Two adults can travel in the back in reasonable comfort, however, the rear bench is snug for three. It’s a shame that Mitsubishi hasn’t fitted air vents in the back to keep passengers cool on warm days. The 442-litre boot compares well with the new Nissan Qashqai’s 430-litre load limit. The Mitsubishi ASX’s floor is quite high, but it leaves underfloor storage space. Folding the rear seat backs down to extend the space is a quick and easy job, with no need to tilt the seat bases out of the way first. There’s a slight slope to the floor with the seats folded, but there’s no gap between the boot floor and the seat back. However, overall, Practical Caravan's Mitsubishi ASX review revealed this to be a tow car with respectable cabin and luggage space, making it very a practical car. The price of the new Mitsubishi ASX is around 10% less than that of the old version, to make the 2014 offering better value. The range now starts at £14,999. Our test car, the range-topping 2.2 4 4WD Auto, costs £23,899. You can expect to trim that if you haggle; What Car? has yet to pin down a typical level of discount. You get plenty of equipment for your money. Leather seats, satellite navigation, a panoramic glass roof, an electrically adjustable driver’s seat, 17in alloys and a reversing camera come as standard. Safety gear includes stability control and seven airbags, along with the reassurance of a five-star rating from safety experts, Euro NCAP. Four-wheel-drive automatics aren’t usually the most frugal vehicles, but the Mitsubishi ASX has a range of features that help: two-wheel-drive mode, low rolling-resistance tyres and regenerative brakes, which capture energy that would otherwise be lost when slowing. Official figures promise 48.7mpg on the combined cycle. That compares with 40.4mpg for the equivalent Hyundai ix35. When Practical Caravan's experts towed with the Mitsubishi ASX on a route mostly made up of A-roads, it achieved 25.5mpg. As for insurance, the ASX 2.2 4 is in Group 20. That’s one lower than the equivalent Hyundai. The ASX comes with a three-year, unlimited mileage warranty. However, rivals from Hyundai, Kia and SsangYong have longer ones, and the car’s service intervals are unusually short at just 9000 miles. Despite the shorter warranty and service intervals, the kit and low running costs make the ASX a sensible buy. The revisions to the Mitsubishi ASX for 2014 take a sound car and make it a better one, say Practical Caravan's reviewers. For caravanners, the 2.2-litre diesel is a plus. There’s no arguing with its 266lb ft of torque, which allows the ASX to overtake confidently even with a tourer hitched to it. Despite its strong performance, the 25.5mpg achieved when towing will help keep fuel bills down. Although the ASX was stretched by Practical Caravan's emergency lane-change test, at motorway speeds it proved stable and composed. The strong brakes were reassuring and we had no issues with the hill start. However, the automatic gearbox may hold on to a high gear for too long, although this is easy enough to solve using the gear shift paddles behind the steering wheel. There’s no work-around for the low 1400kg towing limit, although it will only bother experienced drivers who tow matches over 85%. As a solo drive, the ASX prioritises comfort over excitement. Keen drivers will prefer the Skoda Yeti. While reduced engine and road noise would improve the ASX further, at a relaxed pace, it is easy and pleasant to drive. Inside, there’s sufficient space for passengers and luggage. Yes, the sunroof steals some headroom, but it’s a price we’re happy to pay to get so much light into what is otherwise a rather dark cabin. Keener pricing than before is another plus, and running costs should be reasonable. It may not be an outstanding car, but the Practical Caravan review team concluded that the Mitsubishi ASX is a competent and likeable crossover.